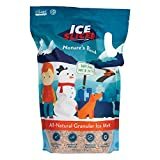 Best Pet Safe Ice Melt! Kid Safe, too. 4.1 What Makes an Ice Melt Pet-Safe? A pet safe ice melt is a necessary winter tool which melts ice without damaging a pet’s feet with harsh chemicals. Remember that although these ice melts are safer than traditional materials, it’s important to keep them from touching skin or getting into eyes. Out of all of these ice melts, the best one is the Road Runner Ice Melt because it is simple, natural, and inexpensive. It covers a large surface area, works in below zero temperatures, and can prevent future icing as well. Most importantly, it is safe for pets and doesn’t damage their paws. For more information on the Road Runner Ice Melt, see below. The runner-up ice melt is the Redmond Ice Slicer. It uses all natural ingredients, prevents future icing, and is non-toxic. It should not harm children or pets, melts faster than traditional mixes, and is safe for the environment. The reasons it is not as good as the Road Runner Ice Melt is because the red coloring can create a mess, and the crystals are large. Large crystals can get stuck between animal toes and cause irritation. For further information on the Redmond Ice Slicer, see below. People on a budget should invest in the Snow Joe ice melt. It comes in a massive 50 lb. package for roughly the same price as 10 lb.- 20 lb. bags of other products. It even has a scoop for easy spreading. The main downside is that this ice melt doesn’t always work well at temperatures lower than 20 degrees Fahrenheit. For a full review of the Snow Joe ice melter, see below. If you can, try to do as much cleanup of the walkway before you place the ice melt, and consider using the ice melt before the storm starts. Consider getting an electric snow blower or power shovel to make cleaning walkways a snap. What Makes an Ice Melt Pet-Safe? Some brands of ice melt advertise as pet safe, but in many cases, the pets will disagree! Arguably no ice melt is completely pet-safe, but there are formulations of melt that are much more friendly than others. If the ice melt contains calcium chloride, it’s almost certainly not pet-safe, no matter what the marketing materials say. If possible, give your pet’s paws a wash when you come in from walking in the snow. This is just good policy and results in less damage to your pet’s paws, less ice melt tracked inside, and better all-around safety. Virtually all ice melts are poisonous to animals if ingested in significant quantity. To add confusion to this circumstance, some suppliers actually add (for some reason) sugars to the ice melt products. These sugars smell good and may make ingestion more of an issue than in regular ice melters. Always be aware of what your dog or cat is doing while outside near ice-melted walkways. Calcium Magnesium Acetate is a common choice for ice melters and has been used by governments around the world for environmentally-conscious ice melting on highways and roads. If you’re using a CMA-based ice melt product, it’s best to apply the ice melt before the snow starts to fall, and continue to apply in stages throughout the storm. Magnesium chloride is a salt, though it is less harmful to pets than calcium chloride. It tends to work in fairly low temperatures. As with all ice melt products, there is a concern when these chemicals come in contact with concrete, especially concrete that is less than one year old. Unfortunately, some chemicals impact some concretes that are even more than one year old, so be sure to test your chosen ice melt in an inconspicuous area before you scatter it widely on your concrete walk. In this section, we’ll look closely at four top ice melters that are safe for pets. We’ll start with a comparison table to get the lay of the land, and then look at each one individually. Note: for purposes of the comparison table, we chose the 10lb container of Snow Joe ice melt for price comparison. Purchasing larger quantities of Snow Joe makes it cheaper per oz. Treats up to 400 sq. ft.
Redmond Ice Slicer is simple to use and requires little effort from the user. It melts ice three times faster than traditional mixes and can leave behind a small red stain that rinses away easily from concrete and asphalt. The downside is that the staining can be tracked around by animals and humans that walk through the crystals. The crystals are quite large and might get stuck in shoes or between dog and cat toes. The product is safe to use around pets like cats and dogs and should not affect children. The de-icer melts ice in a few hours and can continue to melt fresh ice for up to three days after the original placement. The Redmond Ice Slicer works in temperatures as low as 0 degrees Fahrenheit. The product doesn’t use traditional materials and remains listed by the Organic Materials Review Institute. It’s advertised as safe for the environment, though we don’t actually have a list of what’s in this ice melt. Redmond advertises this as containing 60+ chemicals. The Redmond Ice Slicer is one of the most environmentally friendly options on the market, works well in freezing temperatures, and even prevents future icing. It even melts faster than many other similar products. The main downside compared to the Road Runner brand is the red color which can stain and the large crystal size. Each package weighs roughly 9.5 lbs. and contains enough de-icing crystals to cover roughly 400 sq. ft. The crystals are blue and circular and can sometimes leave behind a faint blue stain which goes away in the rain. Like many other ice melters, Safe Paw should be simple to use and can be spread across walkways, roads, and sidewalks. It can prevent future icing for three days after the initial placement and should not harm pets, children, plants, or general building materials. It needs to be rinsed out immediately if it gets in eyes. The active ingredients of the product include carbonyl diamine and a glycol admixture. Safe Paw does not use any salts like more traditional de-icer. It works in temperatures as low as -2 degrees Fahrenheit. While Safe Paws says that its formulation is safe to use on concrete, as long as that concrete is at least one year old, many have found that it damages their concrete, even if that concrete has been poured years ago. It can also remove the color from concrete that has been tinted. Beware, and if you’re going to use this stuff on concrete, be sure to test it in an inconspicuous area before pouring it all over your walkway. The Safe Paw non-toxic ice melter is safe for pets, plants, and children and works well as a de-icer. It even avoids using traditional salts and can work in below zero temperatures! The concerns with concrete are significant, so be sure to check that it does not damage your concrete prior to using this stuff widely. If you don’t have concrete to worry about, then the Safe Paws ice melt is an excellent choice for an ice melter. 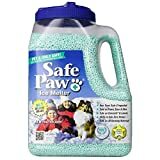 Safe Paw Non-Toxic Ice Melter Pet Safe, 8 lbs. 3 oz. The Snow Joe Melt line of de-icers is sold in several quantities. For budgetary concerns, it’s best to stick with the largest bag you can get, as the price falls quickly per ounce as the size increases. However, moving a 50 lb bag of de-icer around is a pain, so you may want to get a separate refillable container. Snow Joe Melt is pet-friendly and should not harm vegetation like grass, shrubs, or anything else that grows. It can be applied to concrete, wood, and asphalt. The lowest temperature the company claims the ice melt works at is -5 degrees Fahrenheit. This product uses calcium magnesium acetate to increase the melt’s speed and efficiency. It has been used by governments since the 1970s around environmentally-sensitive areas and is a good choice for those with pets. For best results, it’s best to apply this prior to the snow falling. Most snow and ice melts within minutes, but of course, much depends on the particulars of the circumstances. The material should not stick to shoes, paws, or any other surface. Sometimes the ice melt leaves a faint green stain that washes away in the rain or other water. The product also does not work well at lower temperatures, and some people experience difficulties at temperatures as high as 20 degrees Fahrenheit. 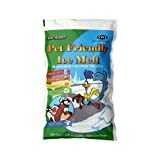 The Snow Joe ice melt is a good choice for pets, especially when purchased in bulk. It doesn’t damage structural materials (though don’t use it on concrete formed within one year!). Snow Joe’s melter doesn’t harm pets or vegetation and doesn’t stick to shoes or paws. It doesn’t quite measure up to the Road Runner ice melt because it doesn’t work in as low as temperatures, and is not as environmentally friendly. The Road Runner ice melt comes in a 20 lb. bag designed to cover 200 sq. ft. The melt looks like simple, small white pellets which can cover a reasonable surface area, even year old concrete. The Road Runner Ice Melt is a pet-friendly option designed not to hurt the sensitive pads on the feet of cats and dogs. It is also environmentally friendly and should not damage existing vegetation like grass and shrubs. It does not include sodium chloride or calcium chloride, which can damage the skin. It is completely organic and contains only biodegradable ingredients. The product does use magnesium chloride, which speeds up the snow and ice melting process. The material shouldn’t stick to shoes or paws and is considered pet-friendly. However, some pets have a bad reaction to it, so try to be conscious to wipe your pet’s paws after they go outside, and see how they react to it over time. A faint white residue can be left behind after use but should disappear in the rain or other water. Road Runner Ice Melt works in temperatures as low as -15 degrees Fahrenheit. The Road Runner ice melt works in the coldest temperatures out of all of these products and is one of the only ones to be completely biodegradable. The staining is also less noticeable because it is white and not an unusual color. Just be careful, as some paws don’t react so well to magnesium chloride. All of the ice melts on our list today are a good choice for pets and kids, though we still encourage users to be cautious when using them. It’s best to wash your pets’ feet after they walk on these chemcials, and check them to ensure that there are no granules stuck in the paws. Also, before you apply these on concrete, test in an inconspicuous area first, just to be safe. 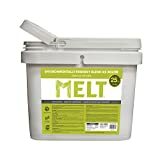 All in all, our favorite pet-safe ice melter is the Road Runner ice melt, and is a great place to start! I am a modern patio design and outdoor living enthusiast. Professionally and personally, I love working with patio and garden design and decor, as well as gardening.